Given the fact that (a) comic book movies are hot, (b) Kavalier & Clay won the Pulitzer, and (c) the last Chabon work to be made into a movie, Wonder Boys, was a critical success, it should come as no surprise that Hollywood would want to adapt Michael Chabon’s novel for the big-screen. Scott Rudin and his production company are currently in charge of the movie under the Paramount banner. Sydney Pollack was initially attached to direct, but after the success of The Hours (also based on a Pulitzer Prize-winning novel), director Stephen Daldry was brought on board. Tobey Maguire (Spider-Man) was set to star as Sam Clay before the film got stalled. Natalie Portman (V for Vendetta) was cast as Rosa Saks before all went wrong. While the thought of condensing a 636-page novel into a two-hour movie may seem daunting, the movie appears to be in good hands. Michael Chabon is adapting the script himself, a rarity in Hollywood. Several scenes appear to have been cut. In a June 2006 Web posting Chabon said several notables will be missing from the film, including the ruins of the World’s Fair, Long Island, Orson Wells, any references to Betty and Veronica, and Stan Lee. However, he also confirmed the existence of certain scenes and themes, including the Golem, a gay love story and Salvador Dali. He also confirmed Kavalier would go to Antarctica, a scene whose existence in the movie had been in doubt; in 2002, Ayelet Waldman, Chabon’s wife, told visitors of the Kavalier & Clay Readerville forum, “You’ll never see the Antarctic scene on film.” Occassionally a new scene has also been added, though, such as the wedding of Sammy and Rosa. The script has received mixed blessings to date. Entertainment Weekly proclaimed the script as its “It Script” in its 2002 Summer Double Issue. However, a few weeks later, Coming Attractions‘ Darwin Mayflower posted a negative review of the screenplay (the site has since gone offline, though you can access the review through archive.org). The script, Darwin said, “is the merest, most basic trace outline of the novel. I think it’s safe to say this is one of those cases where a novel simply could not be made into a movie, unless you wanted to go the Sergei Bondarchuk route and make it five hours long.” The review makes no note of what draft Darwin read, and several revisions were reported after the review was published. No actors have formally attached themselves to the project, though in a June 2006 Web site update, Chabon said Natalie Portman (V for Vendetta) “is a strong likelihood” to play Rosa Saks. If cast, this would be the third film featuring both Chabon and Maguire credits. 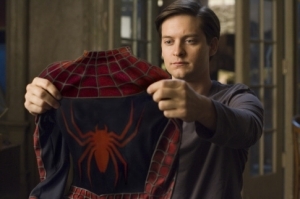 Maguire previously starred in the adaptation of Wonder Boys and Spider-Man 2, which Chabon helped write. When Pollack was to direct, Jude Law (The Talented Mr. Ripley) was being pursued for the role of Joe Kavalier. (An interesting side note, at the same time that Law was being pursued for this movie, Warner Bros. was seeking to cast him as Superman). A later rumor reported by Dark Horizons stated that Ben Stiller (The Royal Tenebaums) was up for the role of Sammy Clay and that Paramount was eyeing Jennifer Connley (Hulk) to portray Rosa.